They last for a couple of months depending on often they're used. 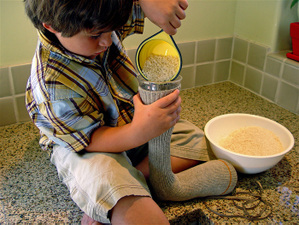 Eventually, the rice will start to break apart and little bits may come through the sock - that's when you know it needs to be replaced. They're so easy to make, though, you can have a new one in a jiffy. 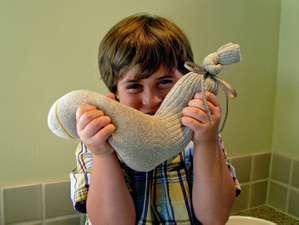 So, get some socks and rice and get ready to get cozy! i make these for my doula clients. i also add lavender. if you don't have a microwave i heard you can heat them in the oven at a very low temperature. i think they have to be in there for a long while though. i haven't tried the oven method myself. Great idea! We don't have a microwave though, any idea about how else we could heat it up? I would love that this winter. Come by my blog, there is something there for you. mmmm...these are the BEST!! We add lavendar to ours; makes it smell wonderful. 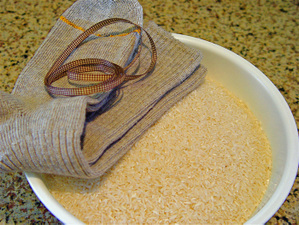 You can also put the sock in the freezer; the rice won't freeze but it gets nice and cold. Perfect for putting around the back of your neck when it's 100 degrees out.